Think of the tedious journey, boys, going to Vandiemens Land. And for fourteen years transported unto Vandiemens Land. She gave us good usage going to Vandiemens Land. And they hitched us to the plow, me boys, to plow Vandiemens Land. But when I awoke my heart was broke, off on Vandiemens Land. Anthony Van Diemen of the Dutch East India Company chartered an expedition led by explorer Abel Tasman resulting in the first European landing on land (later discovered to be an island) off the south-eastern coast of New South Wales (Australia) in 1642. The island, later renamed Tasmania, was colonized by the British in 1803 as a penal colony with the name Van Diemen’s Land. Convicts were sent to the island from that time until 1853. Several traditional ballads mention punishment by transportation to Van Diemen’s Land. In this one, once prevalent in England, Scotland, Ireland, Australia and North America, the crime is poaching. 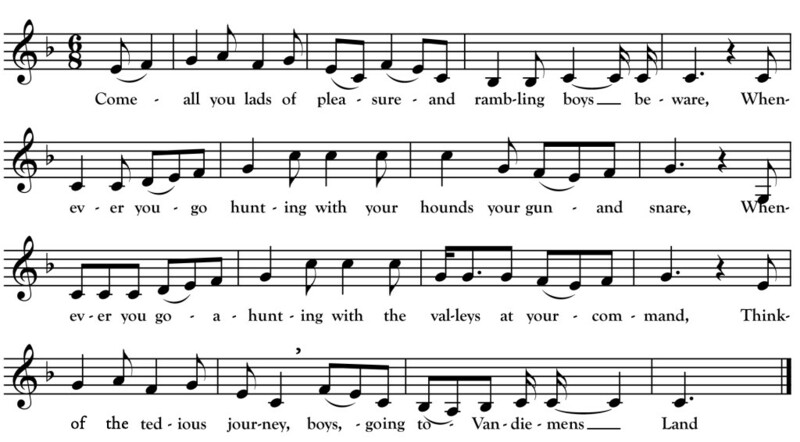 This version, collected from Minnesotan singer Mike Dean, is from the point of view of a convicted Irishman though his criminal shipmates are poachers from Nottingham, England. Other versions tell of poachers apprehended in Ireland itself. In the 1800s, the right to hunt in England and Ireland was limited to the aristocracy. Poaching was not the violation of animal protection laws it is today but rather an assault on the property of the wealthy who kept game on their lands. Poachers were usually people from the lower classes seeking food or money from the sale of wild game on the black market. Mike Dean was himself an avid hunter who made many trips around Minnesota and eastern South Dakota hunting prairie chickens while living in Hinckley in the late 1800s. It is interesting to imagine what this song meant to him as the son of Famine immigrants from County Mayo.